Today I am Reviewing one of the eye liner which is laying in my stash for longest periods now. It's LA COLORS Grafix Liquid Liner - Navy Blue. Graphix liner is the perfect eyeliner to create fine or bold lines. Unique flexible, foam-tip applicator provides precise lining to emphasize eyes beautifully. 10 magnificent shades to choose from! your post here is the rite your post here. The liner comes with long handle and a foam tip.The applicator is very stiff which helps with to the point application helping you achieve those sharp features. Also because of the long handle it is not very easy to apply it in a straight line. 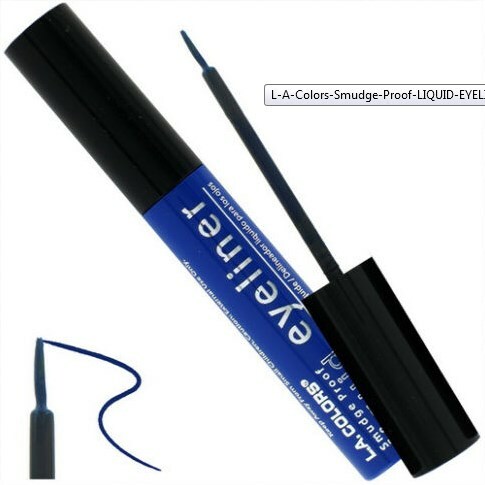 The product comes in a simple black tube with the cap of the color of the eye liner shade. This makes it easily recognizable and helps with effortless searching. The formula is a little bit more watery. Though it does not run into your eye but I will still call it watery. For those concerned with its pigmentation , Its not much pigmented and you have to apply it almost 3-4 times to get the exact color of the bottle cap. However this is water proof and smudge proof once it dries and is not going anywhere. Overall, It's a failed product for me and if not for the color of the tube i would have discarded it already. It's a great colour, shame about the lack of pigmentation, I can barely get eyeliner on straight once nevermind a couple of times! The bottle is a stunning shade of blue, just a shame that the product isn't that great! oh too bad it's not that pigmented! I love colored liners but they need to be good ones!